Welcome guests with your progressive values. Unique accordion poster design. Accordion fold out poster, string included. The large vertical is great for public spaces: on doors, in foyers, on lecterns. Wrapped in a biodegradable cellophane bag, rather than an oil-derived plastic bag. 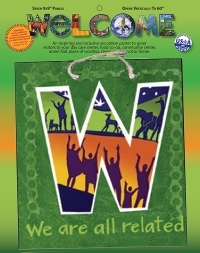 9" x 60"
Each of the seven panels in this accordion poster contains a beautiful, single letter from the word "welcome" and a sentence starting with the letter on the panel.